Well, the scooter Art bought a couple of months ago was a bit too small to make the daily commute into St. Paul, so he bought a bigger one (a 200 cc bike). 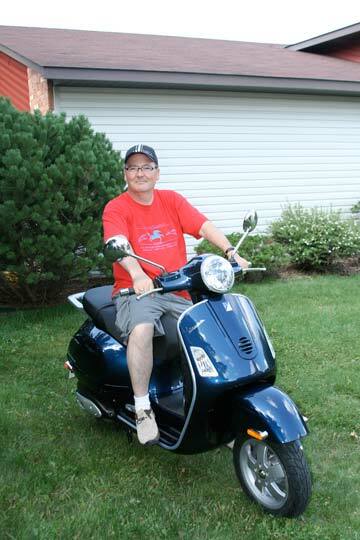 That’s Art above, astride his new blue Vespa Granturismo. It scoots right along and has cut about 15 minutes off Art’s commute time. He still parks it right on the sidewalk outside his office door. So far, he’s getting 73 mpg. Not bad. He has to fill up every two weeks, which costs him about 7 bucks. Beats the $60 a week he was spending in the car. Now, if he can just shake the urge to shout “Ciao, bella!” at all the pretty girls he passes….